(Barbara) and James (Christy) of Cologne, MN; Thomas of South Haven, MN; grandchildren, Maureen, Mary Kathleen, Daniel, Sarah, Kari, William, and Lucas,great-grandchildren,Parker, Cora, Riley, & Ryder . He was preceded in death by his wife Mary Antonette (nee Beckwith), son Stephan, sister Donna, parents Pearl and Al, and grandson Michael. Gene was born December 13, 1929, in Grand Rapids, MI and attended Catholic Central High School and Aquinas College there. He is a graduate, BSME, of the Univ. of Detroit. He held various engineering or management posts in Grand Rapids at General Motors, Lear, National Waterlift, and Lear-Siegler before moving with his family to Excelsior, MN. Gene held various management positions at Control Data, Bloomington, MN. In 1984, he and his wife Mary relocated to Austin, TX, where Gene held various positions until retiring. In 1994 they moved back to Minnesota, to a home on Clear Lake, south of Watkins. Gene enjoyed hunting, fishing, playing bridge, and home improvement projects. Mass of Christian Burial Friday, September 15, 2017 at 11 AM at St. Joseph's Catholic Church, 41 E 1st St., Waconia (952-442-2384). Visitation 1 hour prior to Mass at the church. A luncheon will follow the service at the church. 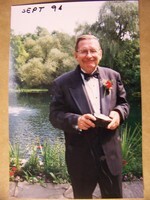 Interment of Gene’s ashes will take place in Grand Rapids, MI. A special thank you to Allina Hospice and New Perspectives in Waconia for their loving care and support. In lieu of flowers, the family requests memorials to Allina Health Hospice Foundation or to the donor's choice.